On Monday, May 26, 2014, Memorial Day events in Arlington Heights include a Parade (9:30 a.m.) through downtown from Sigwalt Street and Arlington Heights Road to Memorial Park at Chestnut and Fremont, and a Ceremony in Memorial Park immediately after the parade (about 11 am). 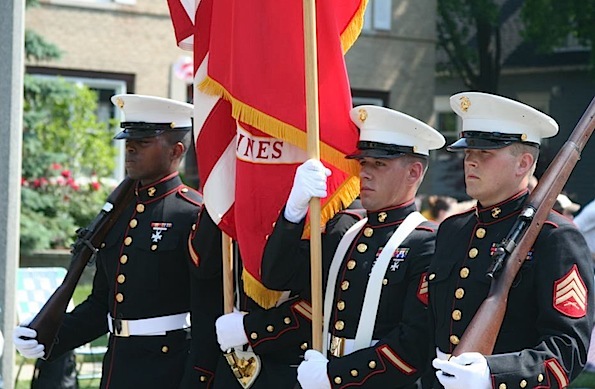 The new Honor Flag unit from Glueckert funeral Home will again be marching in this year’s Memorial Day parade to honor those who have died while serving our Country as well as living Veterans and Service Members. American Post No. 981 Veterans of Foreign Wars will host the Memorial Day Parade at 9:30 a.m. May 26, 2014.